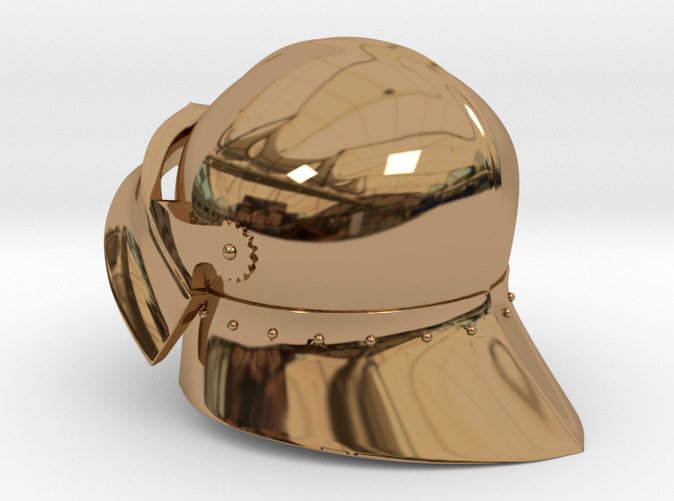 This is a very well made reproduction of a late XVth century german sallet, but adapted to fit your playmobil figure! 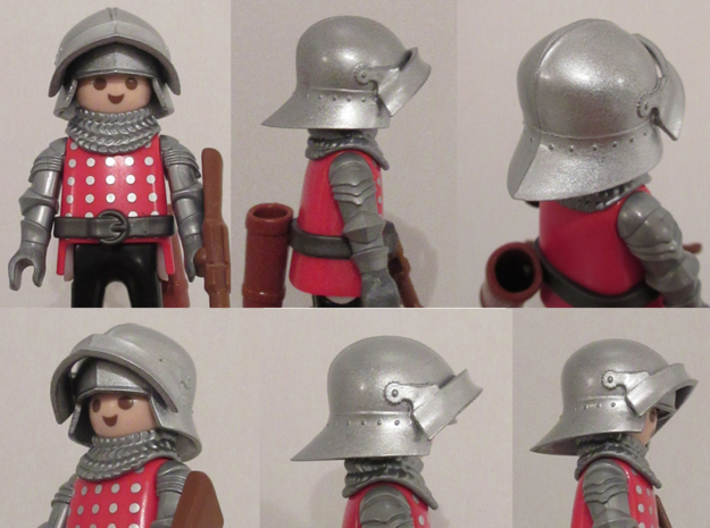 By far, the most historical accurate medieval helmet that you can fit on a playmobil figure. The most important details such as the overall shape, the top ridge, the center line, the liner's rivets, the decorative horizontal line and the pivots decorations have all been reproduced. Very similar helmets are still in museums and are dated 1480-1490, made in south Germany. 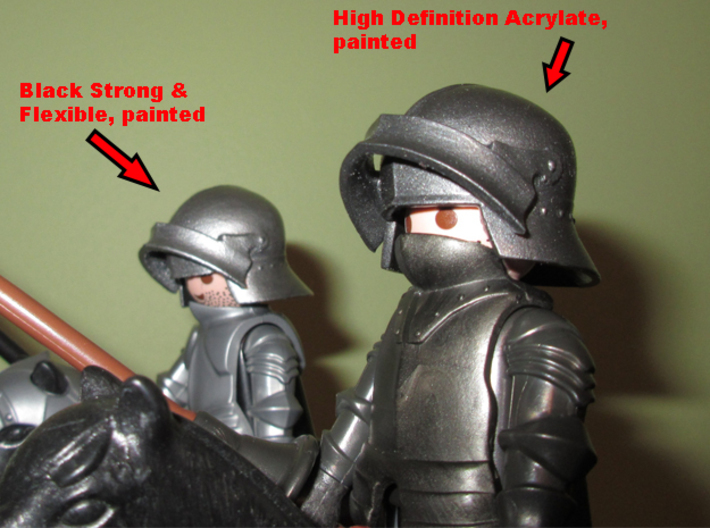 Fit: This model replace the figure's hair, so you must take off the hair of your figure and the helmet will clip directly on the head. Compatibility: Take a good look at the pictures. 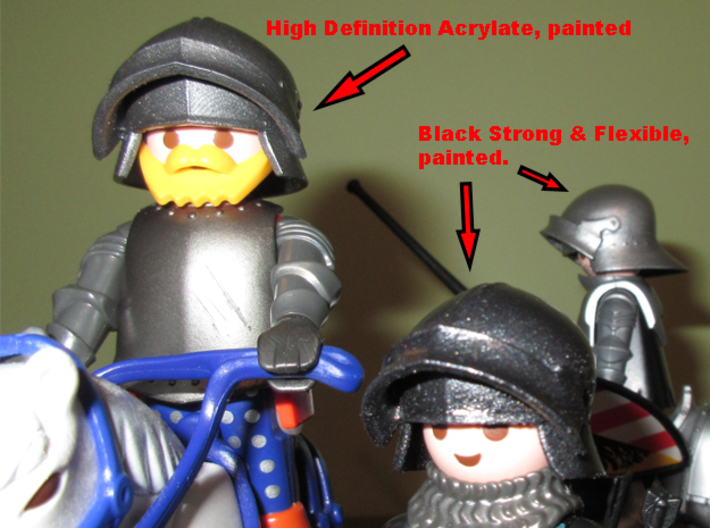 This helmet is not compatible with all playmobil accesories. It works well with some beards I have in stock, but it will be a little tight with few others. It will not work with some neck and shoulder accesories. 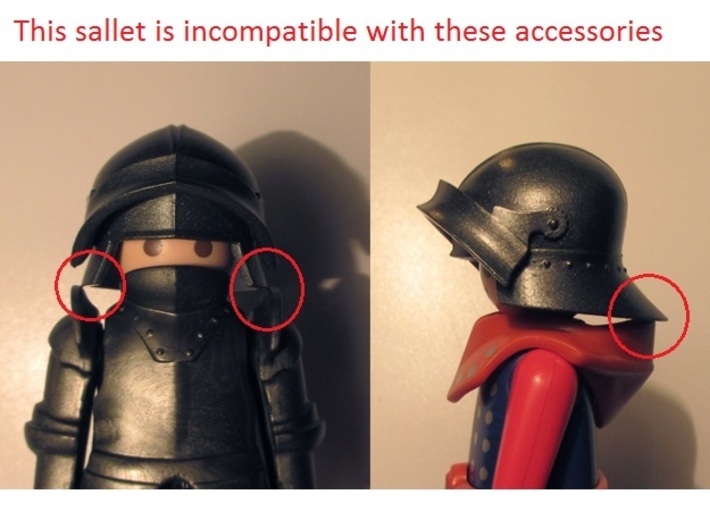 I don't have and I don't know all Playmobil accessories, so my pictures shows the compatibilities issues only with the accessories I have. 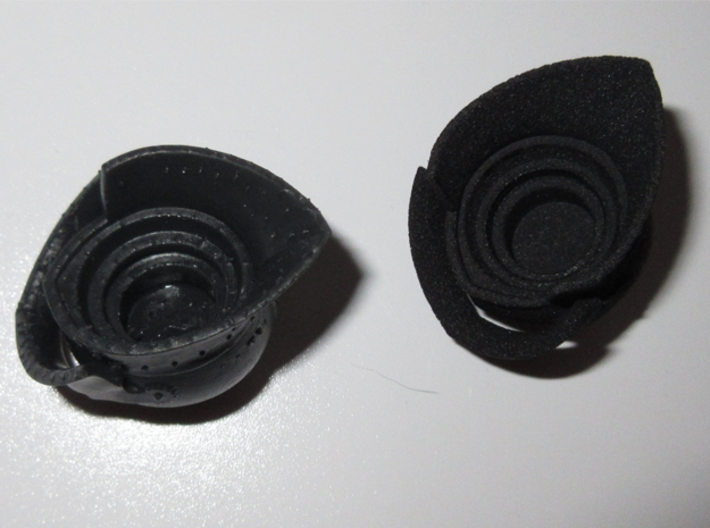 Materials: I tried it in black Strong & Flexible plastic and in black High Definition Acrylate. 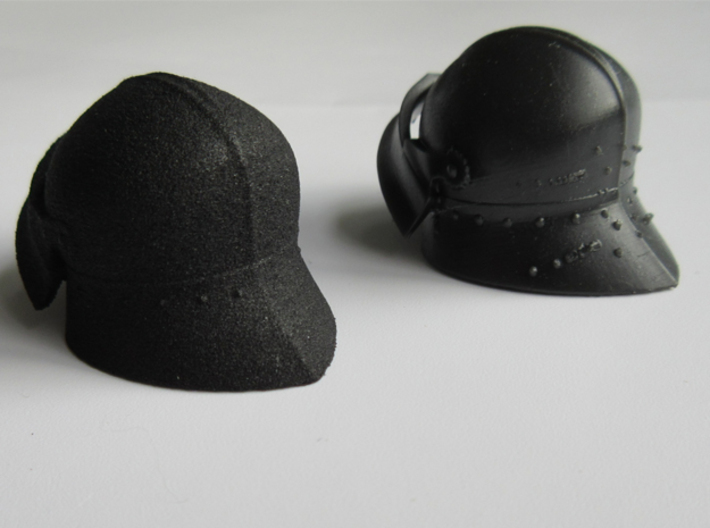 The Strong and flexible version looks good, as long as you can live with the porous finish of this material and the loss of details. 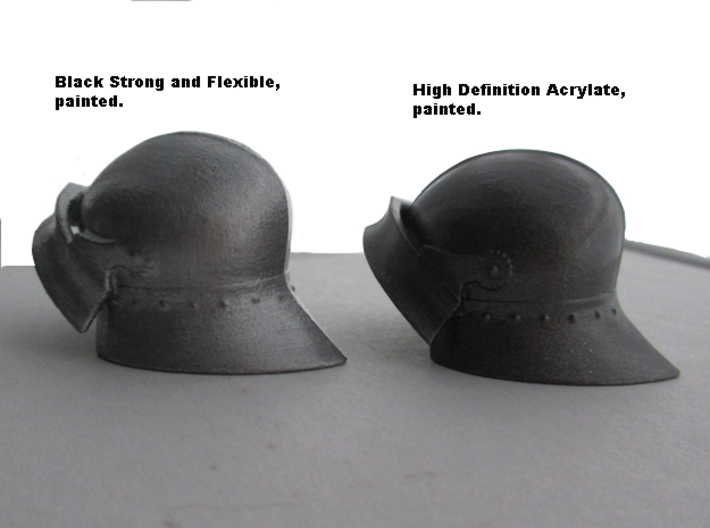 The High Definition Acrylate have a much better finish in my opinion, but you have a lot of sanding to do on it because of all the marks left by the support structures inside and outside. I used a 400 grid sand paper to finish my 3D model and the result was very nice!